Amigapd would like to thank both Aaron and Adam Fothergill for for taking time to answer some questions about their Amiga games which were written predominately with AMOS as well as their current work. __You mention in previous interviews that you started programming on the Commodore Pet as a teenager, did you manage to produce any complete games and were any of them ever released? You made games for the Atari St and the Amiga – did you notice any significant differences between the two machines and did you have a preference? Many gamers compare Jetstrike (1994) to Wings of Fury (1987), but many would be unaware that the game engine actually came from SkyStrike; an Atari ST game written in STOS (a close relative of AMOS), from 1990. Was Wings of Fury an inspiration behind the original Skystrike? Nah, Jetstrike is the followup to the STOS game SkyStrike we wrote, which followed on from various similar ones I wrote without being released on the Apple ][ and ST (using Applesoft and GFA Basic). I missed Wings of Fury on the Apple ][ and only saw the Amiga version partway through writing Jetstrike. Did you convert any games between AMOS and STOS and if so was it an easy process or one that caused lots of headaches? Were you involved in producing game tools for STOS and AMOS – I seem to recall seeing your name linked with the map editor TOME for AMOS. Where these created originally to help your game projects or were they stand alone projects? Aaron: We developed TOME for STOS and later AMOS as we needed a map editor for our games but designed them to be able to be sold as tools to add on to the language (TOME came with a set of command extensions for both). Sprite X and CText both took the same route. Were any of your AMOS / STOS games released commercially and if so did you encounter any snobbery from software houses about games written in basic? Aaron: On the ST, SkyStrike and Yomo were both released as part of Europress' Games Galore pack and did pretty well and SkyStrike Plus was released on its own through Atlantis Software (great bunch). All were written in STOS although Yomo had a small amount of 68k. On the Amiga we wrote Jetstrike and Base Jumpers, published through Rasputin games and later Jetstrike CD32 was included in a compilation through Grandslam (the better version actually as it fixed a game stopping bug that got included in the original CD32 release that ended up going to print because our publisher sent the previous build off to Commodore instead of the final one). We saw a lot of snobbery from software houses and publishers because we were using AMOS and STOS, which is why we tended not to mention it. Europress were really good in letting us not include the "Written with STOS/AMOS" badges on the games to avoid this problem. Both Jetstrike and Base Jumpers used specific AMOS extensions written in 68k to boost them a bit but they were primarily AMOS. Were there any unfinished / unpublished Amiga projects you were involved with and do you still have the source code from your AMOS / STOS games? Aaron: We still have bits of the code, although I lost a lot to a hard drive crash years ago. We were working on a game called Chefs Specials (sort of Cannon Fodder with Chefs) that never got released as we shut down and various other little games, like Maya Gold, which was a platformer/explorer/exploding stuff game based on the old Apple ][ Aztec game which I loved. Adam: We've also still got quite a lot of the graphics disks. I tended to draw up sprites for games we sometimes never even started :) Although for games like Yomo, the graphics would be done before Aaron started the code. We also had Yomo 2389 designed and partially coded as a sequel. That's one we'd like to revisit at some point. You released Amiga 1200 / AGA or CD32 versions of Base Jumpers and Jet Strike – did you take advantage of any the improvements in technology? Aaron: That's one where we called upon the services of Nigel Critten. He was already playing with AGA code and the CD32 Joypad so we brought him in to the team to write an AGA extension that we used for them. Using the joypad made a massive difference though, all those buttons! What gave you the unique idea to develop a game based on guys throwing themselves off buildings and all the mini games - in Base Jumpers Amiga? Aaron: I think we saw a documentary (or rather one of those old "aren't these people crazy") short about BASE jumping and thought that would be a fun one. It was potentially a very short game though, so we went with the idea of a platformer 'race' to get them to the top of the building. The mini-games evolved from the power up system and all the 10-liners I was writing at the time, including all the names taking the mickey out of 'real' games like Portal Wombat. If you've ever got to the end with the Fluffy Bunny level, that was about the point where the whole thing had got out of control. During the 30 years you have worked on games with your brother have you ever had a major falling out over what type of game to make or features to add to a project? How did you develop from writing games for magazines such as Jitterbug for the Atari St to forming your own software company? Were you involved in working for large software developers for the Playstation one (Croc 2) and if so how did this experience compare to the smaller independent game projects? Adam: I followed Aaron to Argonaut and ended up doing sound effects, including Red Dog, Alien Resurrection, iNinja, Kung Fu Chaos and others. While it was a departure from doing graphics as well, I was still designing them as a hobby and I think I learned more working with the teams at Argonaut than anywhere else in my career. Flick Fishing was at one point the number one game in the App Store, what achievements are you most proud of from your game writing career to-date? Has the improvements in mobile phone technology and the creation of Xbox Live Arcade (XBLA) made it easier for small developers to regain the financial independence and creativity that used to exist on the 8 bit and 16 bit machines? Aaron: To some degree yes. While XBLA's indie dev creds have moved over towards XNA now, the iPhone's definitely created a whole new industry that small developers have a chance to do well in. It's also a bit of a gold rush where only a few will actually make reasonable money, but it's still a great way for someone to just write a game and publish it just to prove they can do it. Is Slotz Racer your current project or is there a new project underdevelopment. Aaron: We're currently working on a pretty big update to SlotZ Racer, called SlotZ Racer 2 HD. Effectively it's a re-launch but done so that it works as an update for anyone who has the current version of SlotZ Racer. We're switching it to being a free game, mainly so everyone can play, but including a bunch of extras that you'll only get if you've already got SlotZ Racer. There's also going to be a couple of IAP packs of cars, including the very cool Caterhams, with their own championships etc. We took SlotZ Racer off the store while we're doing the update so players don't accidentally buy the old version just before the new one comes out for free, but we've also released a free Caterham Special version of the game to show off some of the Caterham Sevens. We're in the design phase of a new game that should hopefully be out later in the year. Lastly, what is the legal situation for your old Amiga games , Base Jumpers, Magic Forest and Jet Strike – are they available for the Amiga community to download from the web or does a company still hold the copyright for them? Aaron: On Base Jumpers and Jetstrike, I'm not actually certain. The contracts for them were a bit dodgy and when Rasputin went under they got sold on. I suspect they're filed away somewhere at the bottom of a drawer in a random company. 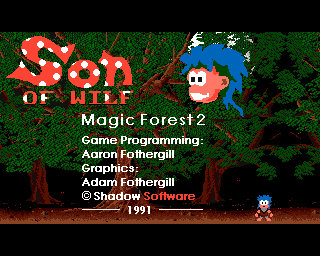 Below is a list of the licenceware games Aaron and Adam were involved with on the Amiga. Some of these are now available for users to download and play for free. The author Richard Moore thanks Brian Bell and Aaron Fothergill on the creditscreen - Aaron may have helped on the graphics. Game created by Aaron Fothergill to show off the capabilities of AMOS TOME. This game was released on the Deja Vu label - once I obtain a copy I will add a screen image and disk image for download. This game may now be missing. AmigaPd would like to thank Aaron and Adam for taking the time to answer the questions and wish them both all the best with their future projects. To find out more about their current work please visit their website Strange Flavour.